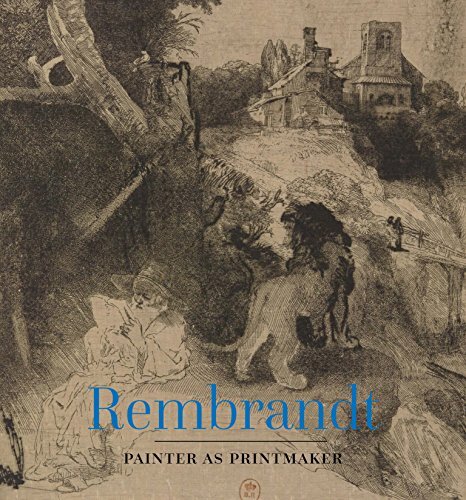 Concurrent with the Denver Art Museum’s (DAM) exhibition to recognize the 350th anniversary of Rembrandt van Rijn’s (1606–1669) death, comes the catalog Rembrandt: Painter as Printmaker. Rembrandt expert Rutgers and DAM curator Standring join forces to etch out interesting findings from years of analysis and research. In the year 1667 the Bibliothèque Nationale de France (the royal library) started a print collection and within 25 years had amassed over 120,000 prints which were pasted into 500 albums. Volume number 97 held 224 Rembrandt prints, a small consideration among the lot. But it is from here that this collection today boasts more than 900 Rembrandt prints, proofs, and states. A selection of which has been considered in this study and sent to Denver as part of the exhibition. There are several thoughts examined in the catalog. First and foremost, Rembrandt seems to have been self-taught in etching technique. Unfathomable as this may seem, evidence indicates that he worked out his own methods through trial and error. Second, the way in which he handled his etching needle corresponds with the changes he made with his paint brush. He was able to transfer lessons learned from one medium to the other. Etchings to him were as much a finished work of art as a painting. The public and more importantly, his target audience, was just beginning to agree. The third observation is that Rembrandt was an astute businessman and knew his market. He was strategic in his styles, finishes, subject matter, and paper selections and wanted to get his product into the hands of his clients quickly and profitably. Recycling was a matter of course, cost, and/or necessity. Whether reusing the copper plates, the compositions, or the character types of his figures, Rembrandt wanted to get the most out of his efforts. A further consideration not explicit in the writings but obvious from the evidence, is just how ahead of his time Rembrandt was. While hair styles and costumes have varied, human nature, facial expressions, and body language have not changed one bit. Rembrandt's stylistic interpretations and character types are strong and impressionable. There persists a little something unspoken, yet recognizable to everyone, in each of Rembrandt's drawings. Which is why today’s audience will find much to connect with. Little could he have known that today’s audience would appreciate his work as much, if not more than, his contemporaries. Rutgers and Standring pack a lot of information into their discussion. They cover a range of topics including artistic technique, biographical information, Rembrandt's colleagues and customers, and his personal life with its windfalls and downfalls. Their writing is easy to absorb, intelligent but not too academic or curatorial. The majority of the catalog consists of reproductions. The 176 pages are filled with 150 color illustrations. A wide range of examples gives an impression of just how versatile an artist Rembrandt was. Image selections are lined up side by side to demonstrate the differences between states, drawings, and paintings in a way that supports the commentary. One fascinating realization is that his pictures are shown in pretty close to actual size. This practice is contrary to most fine art books which need to reduce a piece in order to fit it in restricted handheld parameters. With most Rembrandt etchings measuring merely two square inches, quite a few images are actually reprinted in an enlarged format, revealing each singular etch mark. Normally viewers need to clutch a magnifying glass in order to assess just how technically attuned Rembrandt was to his medium. Three and a half centuries have treated Rembrandt well. It is incredible how an artist who was never really known outside his Dutch homeland during his lifetime could have gone on to have an increasingly respectable and widely regarded posthumous reputation. Achieved through no effort of his own, but instead through curious minds convinced that there remains something special to be uncovered. With thousands of art pieces still left to sift through, it is projects like Rembrandt: Painter as Printmaker that will continue to add to the collective intrigue. Rembrandt's apotheosis is yet to be seen.